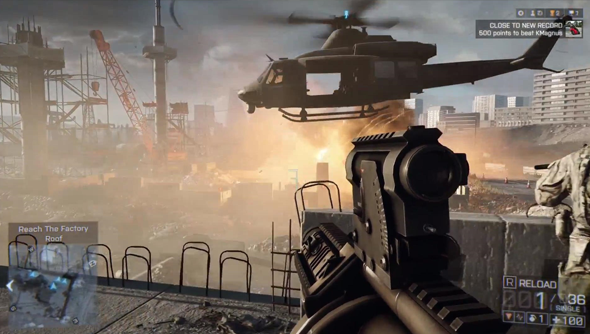 DICE have published a list of changes they’ve made to Battlefield 4 as a result of feedback from beta testers. This goes from the good – reduced stuttering and fewer crashes – to the awful – elevators no longer catapult you into the air. Let’s give those beta testers who reported the catapult bug the thanks they deserve. -Fixed how the player only receives a single local damage sound effect if he or she was the victim of a quick, clean kill. The sound and camera impact effect had too long a cool down between hits. This should improve the responsiveness of being killed and taking damage. -Reduced the fire rate of the AK12 in burst from 1000rpm to 750rpm. The rate of fire was too high when combined with the low recoil of the weapon, making it more powerful than intended in burst mode. -Tweaked the compensator and muzzle brake so they’re properly less accurate in sustained automatic fire. -Reduced and rebalanced full auto accuracy based on rate of fire for all automatic weapons to balance low ROF weapons. Low ROF weapons were remaining accurate long enough to get easy kills outside of their intended optimal range. -Increased the default throw distance of the portable ammo and med packs. This makes it easier to throw these packs to teammates. -Portable ammo packs now reload 2 magazines of bullets instantly and up a total of 4 magazines per pack over time. The player must stay on top of the ammo pack in order to benefit from all of the ammo reloading. Grenades, RPG’s, and other explosive launchers do not benefit from the instant reload function of the Ammo Pack. -Increased the muzzle flash of the 25mm and 40mm launchers to make their threat position more visible. -Fixed an issue where the knife stab didn’t align with the kill event. -The revive time has been increased from 7s to 10s. -Fixed some descriptions of weapons for vehicles that incorrectly described the function of the weapon. -Increased the damage of the Stinger and IGLA to 3 hits to kill attack choppers (was 25%, now 35%). -Increased the speed of all TOW guided missiles to 75m/s from 50m/s so they can catch-up to fast vehicles like the Quad bike. -Increased the sustained fire accuracy of the Coaxial LMG on armored vehicles because it was underpowered. -Reduced the damage the 40mm and 25mm infantry weapons do to armored vehicles to highlight their anti-infantry role. -Reduced the damage main gun on the IFVs against other armor to highlight their primarily anti-infantry role. -Fixed an issue where the tank main gun did not correctly hit the center of the crosshair at all times. -Multiple options are now available for controlling how your vehicles steer with a joystick on all platforms, as well as improved the responsiveness of steering while accelerating. -RPG7 and SMAW can no longer lock on to Laser Designated Targets. It was inauthentic and not balanced. -Fixed some projectiles not warning vehicles when they were fired on a Laser Designated target. Reduced the lock on distance for RPGs, SMAW, and MBT LAW missiles to 350m from 500m. This gives the IGLA the clear long range AA role for soldiers, and keeps the team play element of Laser Designation. -All Laser Designated missiles now do a maximum of 90% damage to Attack and Scout helicopters (down from 100%). This was done to give helicopters a chance to use their Fire Extinguisher countermeasure even against Laser Designated weapons. -The kill string in the score log now appears sooner, making the UI more responsive to a kill event. -The aim assist on X360/PS3 has been tweaked to be more consistent at all ranges. The assist was over powerful at close range, and not powerful enough at medium range. Players should now find that close combat requires much more player input and the snap to a target is far less forgiving. At medium range the player should experience a bit more assistance tracking targets, but generally still reduced aim assist effectiveness. -Fixed a string in On Foot PC key bindings that should have read “CROUCH (TOGGLE) / PRONE (HOLD)”. -Removed an unused “Underslung” key binding on PC, the “Select Gadget 1″ key binding now controls both of these actions as expected.